We advise you to carefully read all of the instructions to prevent your order from being delayed. For the Jigsaw Doctor to make your replacement piece you will need to send him the pieces that surround the missing piece. A copy of the picture will help if you have it. IMPORTANT: We MUST be sent the surrounding pieces. We cannot make your replacement piece from just a picture - even a photocopy, or an accurate tracing. We require the surrounding jigsaw pieces to the one that is missing as they are physically used as a mould to make the replacement piece, in addition to being used for accurate colour matching. We'll make your replacement piece(s) within 2 weeks of receipt. Please allow for postage times either side. (Postage to and from countries outside of Europe is typically 5 to 10 days). 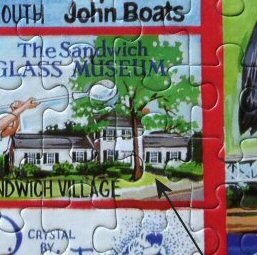 Your hand-made replacement jigsaw puzzle piece will be a good approximation of the original missing piece. The replacement pieces are not made from cardboard or wood. Instead, they are produced using a special epoxy putty that sets like hard plastic. The material used to reproduce your missing piece is a different colour to the original cardboard or wood. Colour matching of the image will be as close as possible to the original, but is not guaranteed to be 100% perfect*. (It will be difficult to spot the replacement without reasonably close examination). The material used to make the replacement is very strong, but will break if mis-handled. Treat it like your other pieces and it should be ok, but don't bend it or tread on it! 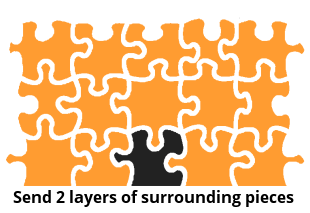 * Believe it or not, the hardest jigsaw pieces to match are the ones that consist of one plain colour. Even more so if the colour is a very subtle shade. Blue pieces (such as sky) are particularly tricky. Complete the jigsaw puzzle and identify the missing piece(s) to be replaced. Put the surrounding pieces in a good quality envelope, along with your details. Send us a copy of the picture from the box. STEP 1 - Complete the jigsaw puzzle and identify the missing piece(s). First put the jigsaw puzzle together to check for the missing piece(s). Measure the LARGEST dimension (including the 'lugs') of the hole for the piece(s) to be replaced and make a note for later as this will affect the price. If there are two or more adjacent missing pieces they will be replaced by one larger replacement piece. 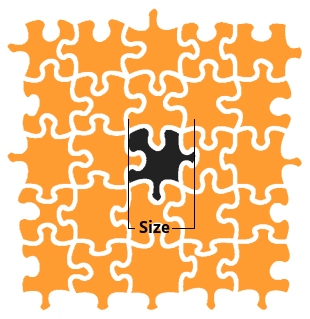 Please measure the LARGEST dimension (including the 'lugs') of the hole of all the missing pieces together and purchase this as a single, larger piece. Edge pieces cost the same as inner pieces. STEP 2 - Put the surrounding pieces in a good quality envelope, along with your details. 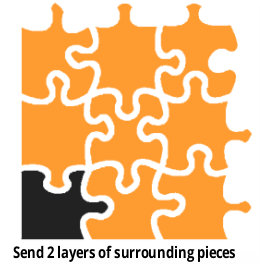 Please send the surrounding 24 pieces to your missing piece and include any edge pieces if necessary. If the missing piece is an edge piece, then the surrounding 14 pieces will be enough. 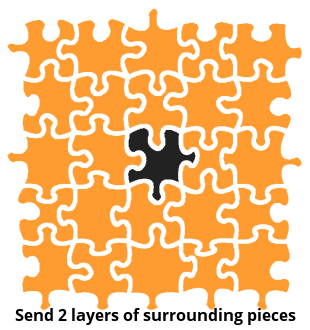 If the missing piece is a corner piece, then you only need to send the surrounding 8 pieces. If you have more than one missing piece together, please send at least 2 pieces in each direction surrounding the missing pieces. Include any edge pieces as necessary. 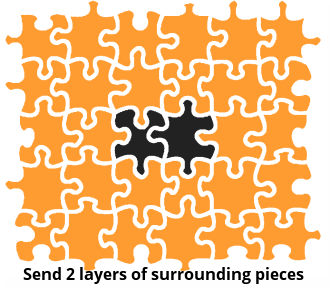 If you are sending pieces from a jigsaw that has lots of different shaped pieces (or 'whimsies') that don't fully interlock, please make sure that you send enough pieces so that there is a stable set of pieces that cannot move against each other. Old wooden jigsaw puzzles are usually cut like this, and the Jigsaw Doctor needs enough pieces to be sure of the shape of the hole that the missing piece occupies. 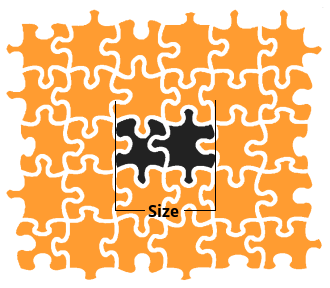 If you feel that there is any chance that we may not be able to make the correct sized piece because there are not enough pieces, then add some more! Put the pieces in a good quality padded envelope or packet. Placed between two sheets of cardboard. Placed on one sheet of cardboard then wrapped with paper, plastic or cling film. The price to ship your pieces to us is affected by the weight of your package. Do not overpack the pieces. One or two pieces of strong carboard just larger than the jigsaw pieces will be sufficient. Try and use an envelope which is just a bit larger than your packed pieces. Any unecessary extra weight will make the cost to ship higher. Please do not tape the pieces together or use BluTac or a similar self-adhesive product either on the front or the reverse of the pieces, as this may damage them. Please do not send your jigsaw puzzle pieces in any type of box, unless you do not want the box to be returned. Our postage rates are based on return of the pieces in a padded envelope and will not cover the additional weight of a box. The manufacturer, title and product number of the jigsaw puzzle, if you can find them. (Please look around on the jigsaw puzzle box). Payment order number or payment (see Step 4). (Do not include a copy of your order). Note to customers in the UK: Please ensure that you affix sufficient postage to your package. It is highly unlikely that simply placing a 1st or 2nd class stamp will be sufficient. We advise you to take your package to the post office to have its weight and size checked. If you do not affix enough postage, Royal Mail will charge us the additional postage, plus a £1 additional handling charge to receive your package. If this occurs, we will have no option but to pass this charge on to the customer. IMPORTANT NOTICE TO CUSTOMERS OUTSIDE OF THE EUROPEAN UNION: To avoid unnecessary customs duty or tax, when completing the customs form please do not mark the value of the package as greater than US$. (£15). In addition, do not include a copy of your order/invoice because, if your parcel is opened by customs, they will use the order value on the invoice rather than the value on the customs form to calculate the duty or tax. If this is not complied with, and customs apply import duty, we will have no option but to pass this cost on to the customer. Consider using your local post office to send the pieces, rather than a courier service such as UPS, FedEx or DHL. You will find that the cost is significantly lower (up to 50% less) to send your pieces using the post office, even if you ask for the delivery to be tracked, and may not take much longer to reach us. Don't forget to include your return address on the envelope so that, in the event there is a problem with delivery of your package, it can be safely returned to you. IMPORTANT: The Jigsaw Doctor (Quantum Enterprises) will not be held responsible for jigsaw puzzle pieces lost in the mail. Please see our terms and conditions for more information. The customer is liable for all postage costs. We will not accept postage charges for the surrounding pieces being sent to us. 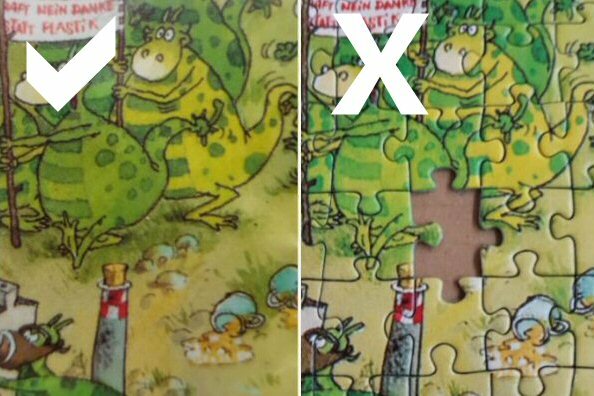 You can skip this step if you are happy to let the Jigsaw Doctor try and re-create the missing part of the image using clues from the surrounding pieces. However, if your missing piece contains an important part of the picture then a picture of it will help us make the best replacement. We DO NOT need a picture of the completed jigsaw showing the missing piece(s). What Type of Picture is Useful? We request the picture from the box so that we can see the part of the image that is missing. A PHOTOGRAPH OF THE PUZZLE WITH THE PIECE MISSING DOES NOT PROVIDE US WITH THE INFORMATION WE REQUIRE. The actual box lid, or section of it. (We cannot return the box lid section as it will cost too much to mail back to you). Poster (Some jigsaw puzzles also contain a poster of the completed picture which is also acceptable to send to us with the surrounding pieces). Whether you scan the box lid, or take a photo, an emailed version of the photo is much more useful than a printed out version that has been mailed to us. 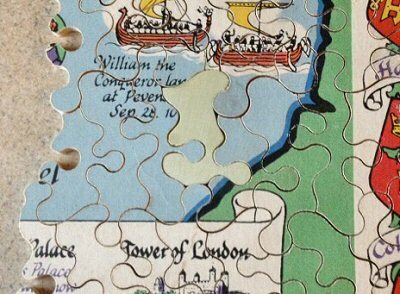 Please note that it is a picture of the missing section of the jigsaw puzzle picture that we require (i.e. FROM THE BOX LID), and not a photograph of the puzzle with the missing piece. If you have a flatbed scanner you can upload a copy of the picture to the Jigsaw Doctor when you place your order. Don't worry if you can't get the whole box or picture on the scanner. You only need to send the part of the picture that contains the missing piece(s). Scan the picture at 300 DPI (dots per inch) using FULL COLOUR. Usually the scanner's default settings should produce good results. If the picture comes out too light or too dark, or the colours look "washed out" or wrong, try changing the settings until you get better results. Save the scanned picture as a JPEG file using your own name in the filename (e.g. johnsmith1.jpg). Check your camera and see if it has a macro setting. If it has, change it to this setting as it will allow you to get as close as possible to the relevant section of the box. Set the photo quality to maximum. Try and take the photo in the best light setting possible, ideally outside on a sunny day. Keep the camera still whilst taking the photo to prevent blurring. Try and take as large a photo as possible of the relevant section of the box lid. If you have a digital image of the puzzle picture, then you will be able to upload it in a special section on the payment page. If you have a hard copy (printed out photo, box lid section or poster), please put it in the envelope with your surrounding jigsaw pieces and information. You can skip this step if you are redeeming a Gift Certificate. Please make payment as soon as you are ready to send us the surrounding pieces. That way we will have your order and know to expect them in the mail. All customers may pay for the Jigsaw Doctor service on-line using PayPal or by credit card (A PayPal account is NOT REQUIRED to pay online). UK customers may also pay by cheque or postal order made payable to 'Quantum Enterprises'. (Also see the important notice in the orange boxout). If you wish to purchase more than one replacement piece, simply change the quantity on the payment page. If you have a double-sided jigsaw, and want both faces of the piece reproduced, please go to the 'Extra Options' category and add this service to your shopping basket. This is in addition to the main replacement service, which you should also add to your shopping basket. Once the Jigsaw Doctor has received your order you will receive confirmation by e-mail. You will also receive confirmation when we receive your surrounding pieces in the mail. Your order will take up to 14 days to process from receipt of your surrounding pieces. Please allow for international postal delays. Credit card debits will be securely made in your own currency. IMPORTANT NOTE: Customers in the UK paying by cheque or postal order. UK customers should still click the payment button below if you wish to pay by cheque or postal order. You will be taken to our main shopping website where you will be asked to provide your details. Select 'Print Order Form' as the payment option. The printed order form, which will contain all of your details and order, can then be placed in your envelope with the surrounding pieces. Please make Cheques and Postal Orders payable to 'Quantum Enterprises'. We strongly recommend that you use the 'Signed For' service for shipping your returned pieces, which you can choose when you place your order. The 'Signed For' service ensures that your package is delivered to a person rather than just a mailbox, and will also provide a tracking number to help investigate where your package is should there be a delay. The Jigsaw Doctor is not responsible for any losses in the mail and we recommend you review and consider the possibility and cost of such a loss, particularly if your jigsaw puzzle is irreplaceable. Clicking on the above button will take you to our main shopping website where you will be asked to make your payment. UK customers should still click the payment button above if you wish to pay by cheque or postal order. You may choose the 'Print Order Form' rather than PayPal option.